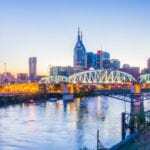 NASHVILLE, TN — It may feel as though like our country is marching backward. But I’ve been part of the history of our country for a long time and have learned to look deeper, past the surface. And what I see now makes me incredibly hopeful. Youth in our community spoke boldly from the heart at the community meeting held with Pastor Howard Jones. They talked about their feelings and their knowledge in dealing with police, citizens and issues of survival. Pastor Jones explained we have to stop our individualism and become a collective community again. “We must show care and concern for our neighbors, families and children. 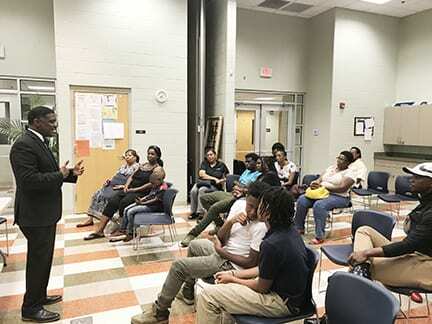 Above all talk with our children, and not at them, which allows us to listen intently to them and have real conversations.” The youth also spoke about police shootings. Some explained they were fearful of the police and felt the police did not have any regard or respect for them, especially as minorities, as well as overall citizens. Community participants said killing is killing, whether police oriented or citizen oriented or done by the youth in our community; these senseless killings must end. Pastor Jones cited the two police oriented shootings in the last two years, Jocques Clemmons, February 10, 2017 and Daniel Hamrick, July, 2018. He also mentioned Officer Matthew Cammarn who was assaulted in Cayce Homes in April, 2016 but did use deadly force on his assailants. Pastor Jones said, “It may feel as though situations in our community make it seem as though we are marching backward. However I have hope, faith and a plan, for a better tomorrow in our future. 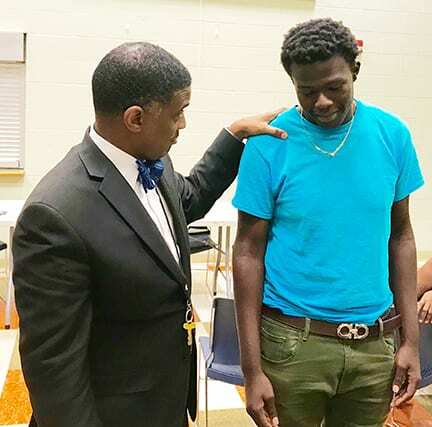 Pastor Jones talks with 18 year old Ronnie Swanson about handling respect & disrespect in order to survive. respected and when that does not occur, he gets angry. “To get respect, you have to show respect,” he said. Malik, offered a different perspective saying, “In some incidents, there may be a time when you give respect and may not get it back and that’s OK,” he added. Another participant said, it is important to understand how we define respect.